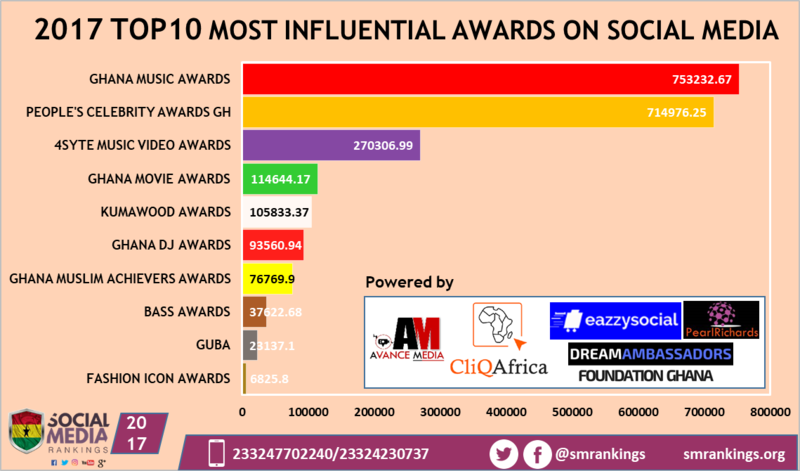 Ghana Music Awards has retained its foremost position as the Most Influential Awards Scheme on Social Media in the 2017 Ghana Social Media Rankings spearheaded by Avance Media, CliQAfrica, Eazzy Social and Dream Ambassadors Foundation GH. Ghana Music Awards which recorded new following across Facebook, twitter and Instagram totaling 50,746 and also maintains a high level of engagement with its audience. 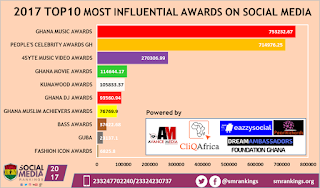 Following keenly is People's Celebrity Awards Ghana which is making its debut on the list recording the highest number of followers across Social Media totaling 627,264. Other award scheme which have the potential of being listed in subsequent rankings include: RTP Awards, Ghana Gospel Music Awards, Ghana Fashion Awards and CIMG Awards.